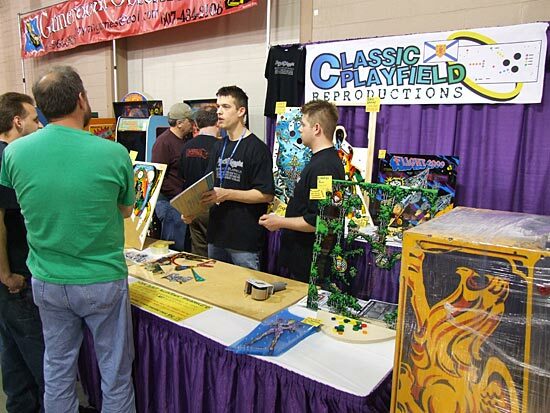 Location: Allentown Fairgrounds AgriPlex,302 North 17th Street, Allentown, PA 18104 , USA. 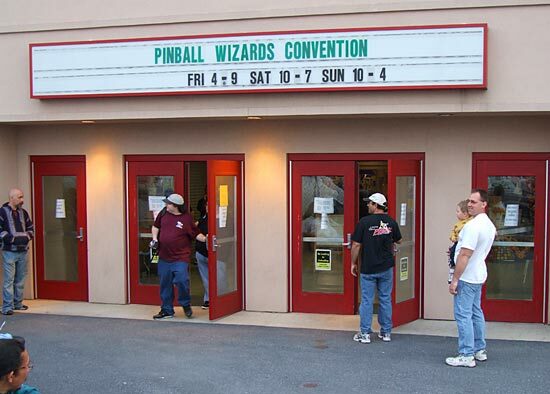 This was the 15th Pinball Wizards Convention, better known as the Allentown Show and it officially opened at 4pm on Friday 2nd May. 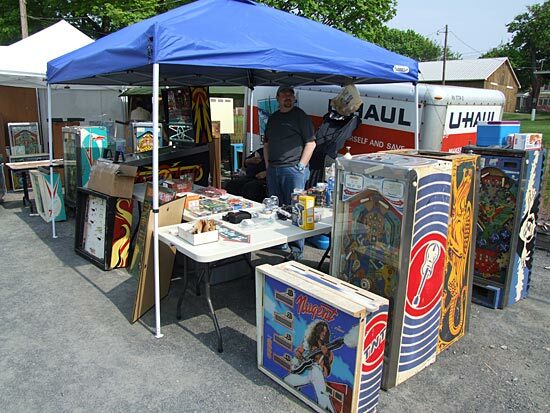 In fact, it started somewhat earlier than that with sales at the open-air flea market adjacent to the show hall beginning almost as soon as the first truck unloaded. 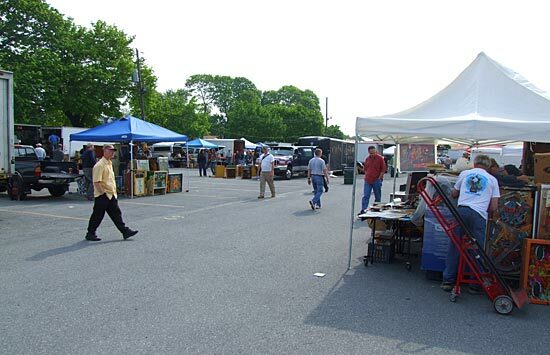 The flea market is a major part of the show and a great place for some bargain buys, the best of which take place early on Friday or late on Sunday as vendors contemplate taking back their unsold goods. Entry was supposed to be restricted to those who had bought show tickets and had their hand stamped, but since this wasn't possible until after 4pm, it was more-or-less free entry until the show opened. 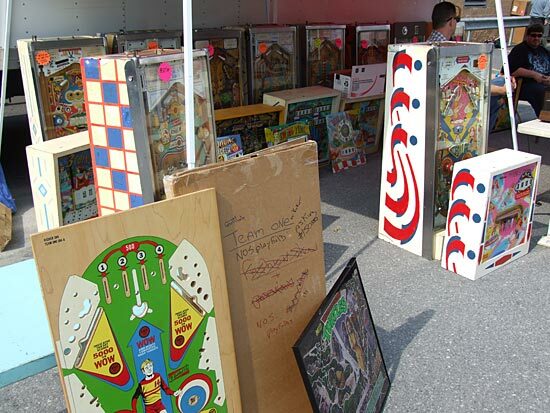 There were plenty of good project games for sale along with the assorted spares and what looked like junk but what could be just the part someone is looking for. There were probably fewer assorted boxes of parts to rumage through but more complete games for sale at good prices. To give you a better idea of the items for sale, we've done a special three minute tour of the flea market for you. 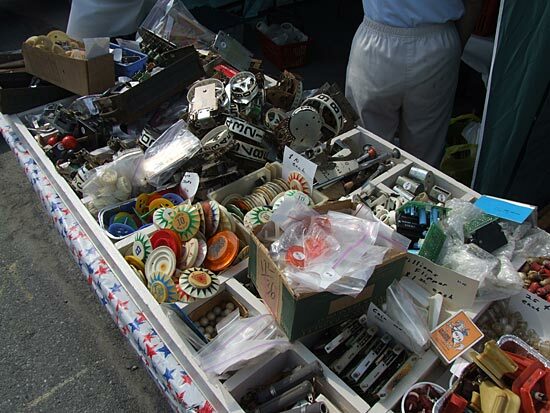 Simply click on the play button below for a walk around the flea market. Entry to the show and the flea market cost $15 per day for adults while a slightly cheaper $40 ticket covered all three days. 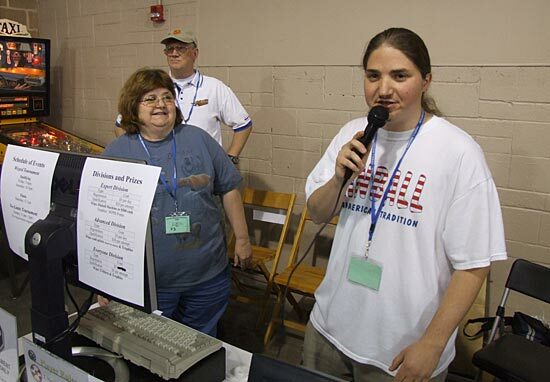 When the show officially got underway at 4pm the hall was opened to reveal a mass of machines and vendors. 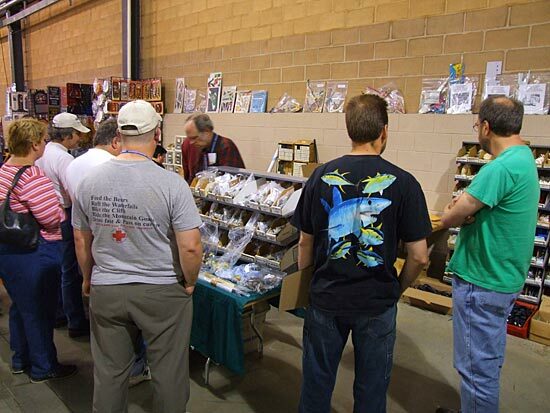 The machines and vendors were arranged around the outer walls with two inner rows of back-to-back machines and vendor booths. Machines marked with a * were not working when the list was made at noon on Saturday. 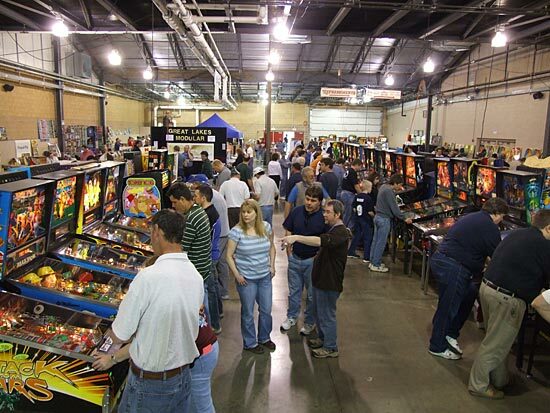 In addition there were 8 machines in the tournament area. They were: Hurricane, Time Warp, Wheel Of Fortune, Mystic, Spider-Man (Stern), Tri-Zone, Countdown and Taxi. 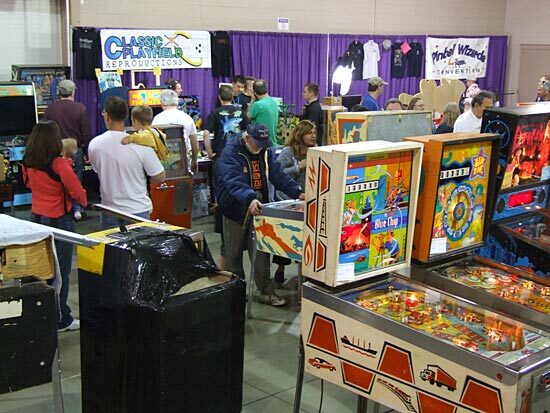 That brings the total number of pinball machines at the show to 168. Apart from the pinballs there were also a number of video games: Donkey Kong 3, Duck Hunt, Ms Pac-Man, Multicade, Multicade, MultiGames, Pac-Man 25th Anniversary and Popeye. 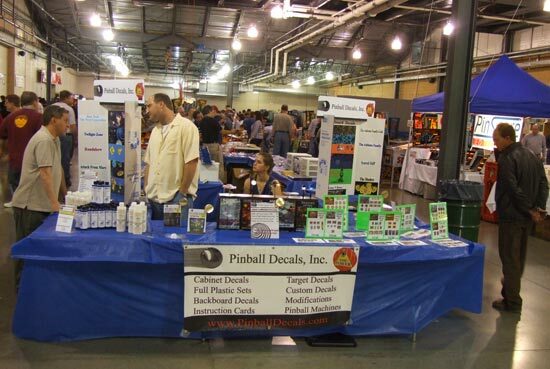 There were plenty of vendors at the show including many of the big names in pinball parts as you can see above. 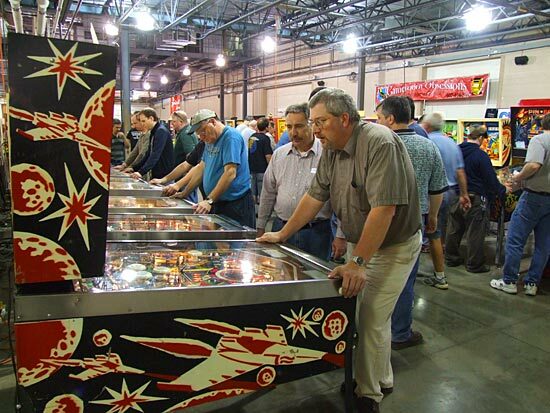 The Pinball Wizards Convention lives up to its name through the three division of tournaments organised and run by P3Tournaments. There was an Expert Division and Advanced Division and an Everyone Division which are self-explanatory. Each division featured qualifing sessions over the first two days followed by double elimination rounds to reach a final two who then played in their division's final. The Everyone Division concluded first with a win for Cam Nosiglia. 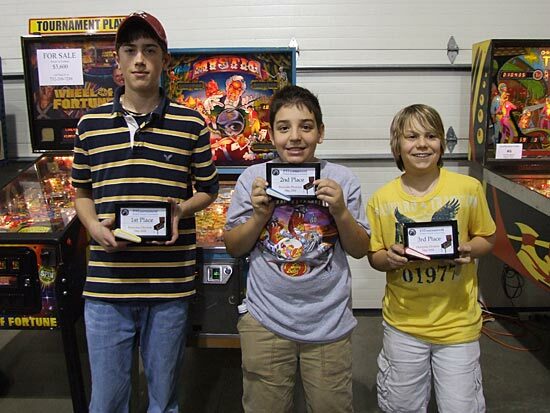 Josh Lubitz was second with Patrick Newhart in third and Matthew Mayle in fourth. 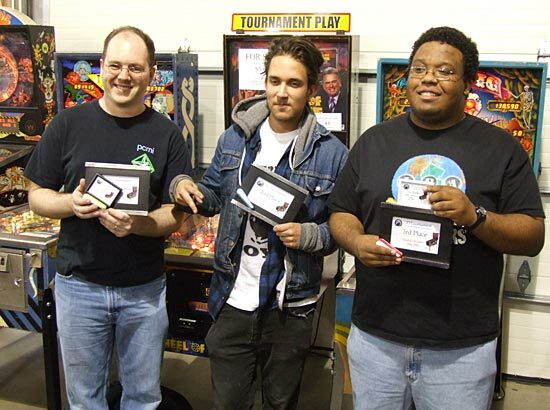 The top three finishers received a show t-shirt along with a plaque. The Advanced Division was decided next which resulted in Richard Weins taking the top spot followed by Chris Nosiglia in second, Pete Hendricks in third and Max Blom in fourth. 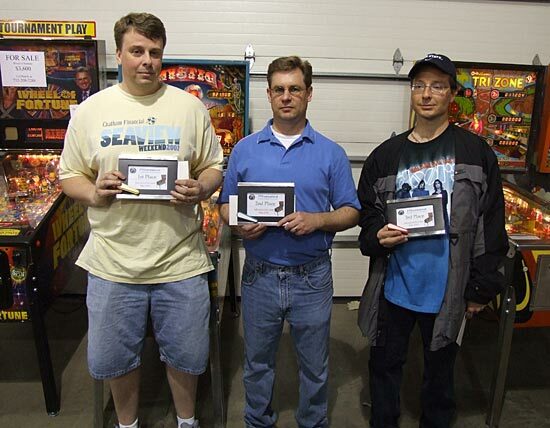 Richard earned himself $300 for first place while Chris and Pete received $150 and $100 respectively. In the top Expert Division, the final was between Bowen Kerins and Jory Rabinovitz, played out on Hurricane. Bowen established an early lead which he maintained through ball two and in a masterly performance, massively increased his score to 186M to leave Jory with little chance of a comeback. Bowen duly took the first prize of the same Hurricane machine. Jory in second earned himself $500, Steve Bowden was third with $400 while Ed Zeltmann was fourth. Sunday was a much quieter affair both in terms of the number of visitors and the number of machines set up to play in the hall. 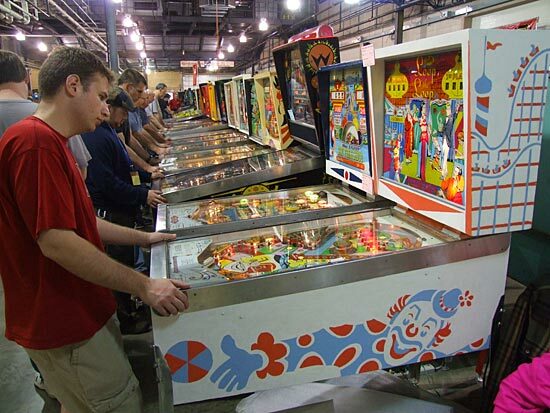 You've read about the show but now you can see it for yourself with our exclusive Pinball News Three Minute Tour. Simply click on the play button below for a walk around the show floor.